Shopping in Tenerife is exciting. Start with the capital in style on level ground. In fact, downtown Santa Cruz has three main pedestrian streets with countless shops, boutiques and chain stores. Shopping delights are found from Plaza de España upwards between Calle Imelda Seris and C/ Emilio Calzadilla with C/ del Castillo being the most popular, as seen on this map. Contrary to before, parts of the Tenerife capital commerce show exciting market initiatives on Sundays, now. Innovative craft works are now sold on the grounds of the ancient castle by Plaza de España in the capital. Spot the ruins of once gracious arches in the background in the photo below. That's where you find its Mercadillo Castillo Santa Cruz a Christmas Market. Some stalls of some winter markets are seen until the capital's May celebrations. Street vendors are also busy at the Rambla and at Parque Garcia Sanabria. Visitors from 50 yearly cruise ships for Santa Cruz will love this kind of shopping. Last time in Santa Cruz Central, I couldn't resist taking a photo of a red shop. It displays flags and flowers by its tall windows which are broken up by paintings. Their biggest wholesalers are in the capital of the biggest Canary island in Santa Cruz. Indeed, you have a better chance to discover the lens for your old camera there. Halloween pumpkin with sweets on its back. 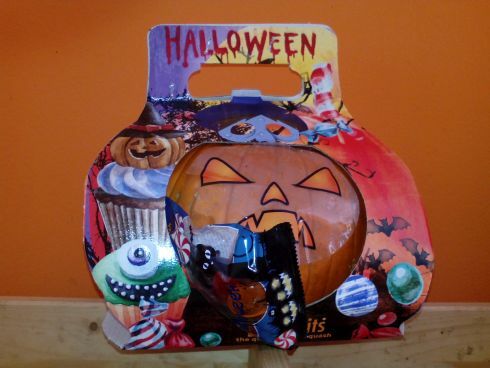 Buy the €3,95 Halloween pumpkin shown above with spooky sweets attached to its back at a Toscal Longuera vegetable market... Otherwise, at all the Tenerife Lidl stores... Nothing "Halloweeny" seen there, lately, though. All big malls and supermarkets have in stock gourds for Halloween at that time of the year, by the way. In 2013, Saturn for electronic gadgets was fused with a sister business called Media Market. Tenerife Media Market where click 'ver catalogo' to see some products. By the way, we have even seen plug points to charge an electric car in the underground parking of Centro Meridiano. Needless to say is that you find the most popular European Brands besides international imports for shopping at this ultra modern, gigantic mall with free WiFi and free underground parking. And there is also Carrefour. Open every day except Sunday from 9.00-22.00. Christmas time on Sundays too like all big malls. Worten sells electrical, electronic, video, audio and computer articles. It prides itself of best service for a huge variety of goods and best prices. The street flea market in Santa Cruz is for Sunday shopping only. Opening hours from 7 a.m. to about 2.p.m. 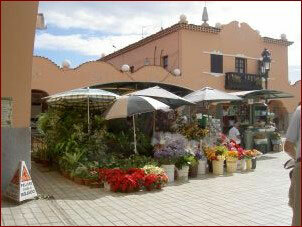 They are more or less the same in all such Tenerife 'Rastros', except for the night market of Los Abrigos. 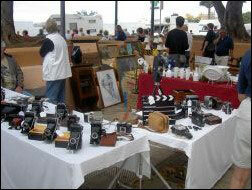 In the past, you could find interesting things for your holiday home in Tenerife on the capital flea market. However now, no more antiques, precious toys, miniature dolls, match box cars and the like... Instead, buses bring people now to the Puerto Cruz flee market where interesting things are still found on several 'Rastros'. 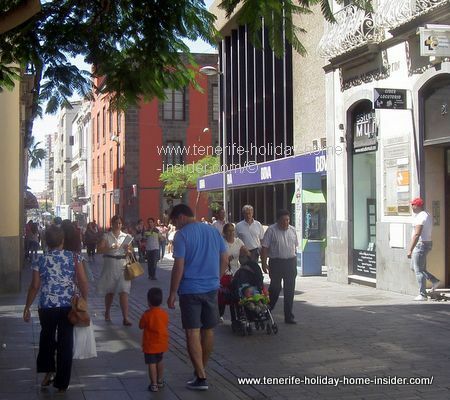 The photo above is typical for Tenerife capital downtown shopping. Look at the relaxed mood in this tree lined street. It leads off Plaza de España. There downtown, many street cafés and bistros with terraces invite for a rest. Sometimes traveling musicians play for you there while you have a meal or just a refreshment. Shopping in Tenerife will be extended towards the water front by Plaza de España, sometime in the near future. More about it when the construction works start. The old Corte Inglés department store is right opposite this restaurant/café. 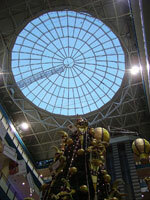 Not that long ago, it was the biggest attraction for shopping in Tenerife on the entire island. tiny enclave with center pavilion by Restaurante El Aguila. Have a shopping pick-nick in this semi tropical oasis surrounded by street art of unisex working people made by the Dutch lady sculptor Hanneke Beaumont. Typical Tenerife embroidery made in China is offered by street vendors in this shopping district. 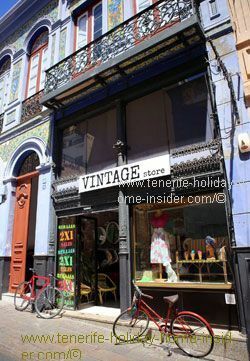 The genuine hand made variety is sold in shops which are said to be cheaper than in other Tenerife towns. Embroidered articles are not ideal for the renting out of your holiday home in Tenerife. Chose between black or white silk stoles. They are usually stitched up in many colors, as is custom. Shopping in Tenerife for such light garments to take overseas as gifts is a good idea. We would have thought so before going to Tenerife souvenirs Masca. 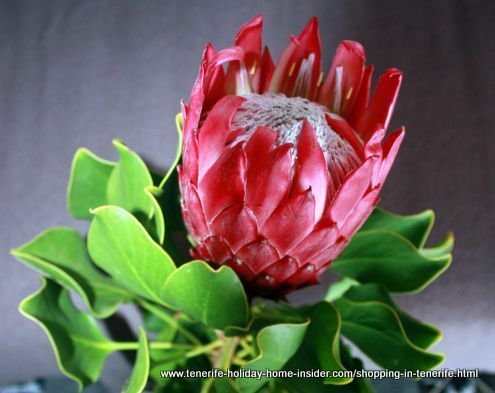 What about King Protea flowers? Business hours: 9a.m.-2.00p.m. and 4.30p.m.-8.p.m. 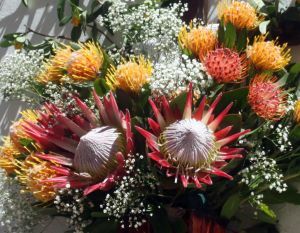 Saturdays: Mornings until 1 p.m.
Tenerife Proteas Leucospermum Pincussion species as well as the King Protea. More Tenerife Proteas from Palo Blanco were on offer in the same shop, one day after I bought the King Protea. Part of them were golden, rust-red and yellow species the so called Pincussions. The picture depicted beside includes all of them. This flower arrangement was made for the Fiesta de la Cruz of Los Realejos. That's a celebration in honor of a Tenerife Christian festival of the cross the Crucifix in theological terms. Hot tip for shopping in Tenerife. There are some antique shops in Santa Cruz. But, more are in the 2nd biggest town La Laguna. I always want to go there to hunt for an old special Spanish fan. Once, I glimpsed such an amazing shop while rushing through with a friend. I hope I will find it again, one day. La Laguna antique sales are very interesting for shopping in Tenerife. What you make out, here, is a Christmas decoration within Carrefour Tenerife Hyperstore very close to the Santa Cruz Tenerife capital. 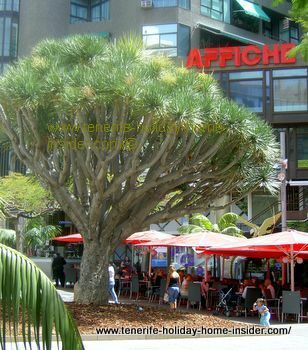 Now, the smaller branch at C/C Meridiano is just a bit further uphill from Corte Ingles , as mentioned in a list earlier on and which is also one of huge malls for shopping in Tenerife. The Carrefour hyper mall is at Añaza on TF1 South Carretera del Sur. It takes you about 5,9 km to get there from Santa Cruz. No parking problem exists at Tenerife Añaza Carrefour, where a bus takes you too, by the way. Find out why I didn't buy a sofa at Carrefour Tenerife Santa Cruz the smaller branch and where I bought it, eventually. This was part of my island shopping adventure when searching for all kinds of items and furniture for a holiday home in Tenerife. Hypermarkets Alcampo Tenerife again leaders for cheapest shopping in 2017. 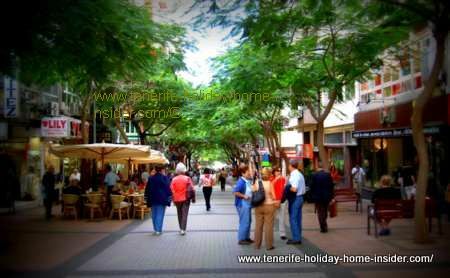 Do shopping in Tenerife in the outskirt centers using Tenerife public Titsa buses. 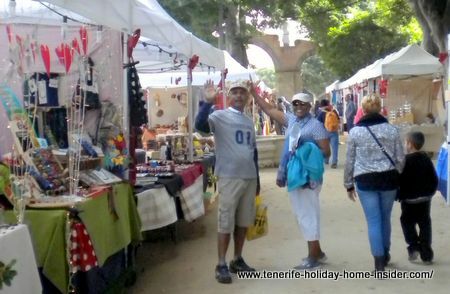 Go to La Laguna on the TF5 Free Way with Titsa bus 102 as well as for Ikea of Tenerife, while Alcampo of La Laguna also has a mega store supermarket which includes groceries and fresh produce as well for shopping in Tenerife. Tenerife's biggest sports mall called Decathlon where English is spoken is right beside it. Discover all about vibrant shopping at Alcampo La Laguna as well as at La Villa which is also known as the TF5 shopping mall la Orotava. 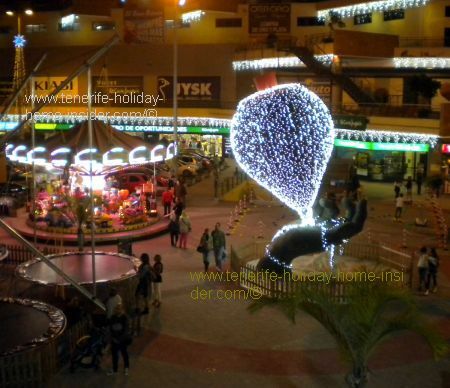 This place is similar to a fair ground by the way it accommodates half of Tenerife North shoppers with mall nightlife of Spain. Find those shopping locations most entertaining during Carnival, Christmas and at other events after hours. Supercor convenience supermarkets La Laguna and Abona de Grenadilla as well as Supercor in Puerto Cruz which did not keep promise to be open all hours. Mind that one in the Puerto hub is now open until midnight. About Shops of Lidl Tenerife and the one I prefer. 30 new supermarkets Coviran cooperatives, one of which replaced the former 2000 Spar and later Sumo in La Paz Puerto de la Cruz. Are supermarkets in the north cheaper than in the south? I am for ever told that the south is much more expensive than the north. My friend César used to buy a fair deal in the north before Los Gigantes opened its own Mercadona and Lidl stores nearby. What about Hiperdino? I knew one in Los Realejos almost next to Mercadona. People stopped shopping there and only went to Mercadona. It's been an empty shell for a while now. This also reminded me how I was shocked about the price of bread at a Hiperdino in the capital Santa Cruz. So unless, somebody proves to me that this isn't the case in the south I am not prepared to change my mind. Also check out electrical appliances at the Electro Bazar Icod, S.L., Avda.25 de Abril, 53 - San Sebastian, 8 - Icod de los Vinos, Tel: 922 81 04 19. Santa Ursula Center has furniture shops. Most shops in Santa Cruz Tenerife capital are closed on Sundays, public holiday and during siesta from about 1.p.m.to 5p.m. but, there is the Mercardo de Nuestra Señora (flea market is part of it) where you may also haggle out a bargain. Mind also second hand shop with vintage dresses, antiques and more on occasion at Toscal Longuera. Discover Leroy Merlin Tenerife for much more than just the handy man with many hot tips. Other big stores in its vicinity cater for bath rooms only, others for tools, exclusively, yet another outlet offers furniture. One of Tenerife's biggest nurseries is Lalyflor. It is also up the road by Leroy Merlin. It had the biggest collection of most stunning orchids which are imported from Holland (If I recollect well) on sale including enormous flower pots of all sizes and huge plants when I last went there. A while ago, I saw a handsome Lavender plant on sale there for only €2. Mind, Laly Flor also does wholesale business. This is at the adjacent La Vera suburb of Los Realejos and not at La Villa Alcampo. Go to Laly Flor for plant decoration for a holiday villa or the like which needs a green boost. Giant pots and plants for instant effects are also available besides tools and gardening machinery. It's opposite the Latest and biggest Corte Ingles Tenerife of Santa Cruz. Shopping in Tenerife Mercadillo la Matanza. La Matanza market Mercadillo del Agricultor, del vino y artesania on the TF217 motorway is open on week-end mornings. It is more than a farmers market with two market halls. Interesting locally produced wines... It has a bar and Cafe where people love to eat Churros. 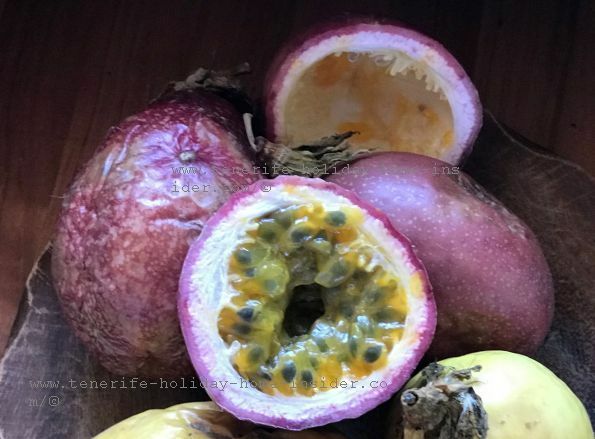 Tenerife shopping at La Longuera for Passionfruit Granadillas similar to Gooseberries in taste - Very healthy food and cheap at less than one Euro to boost your bones with Calcium and Magnesium against Arthritis, a superb sweet-sour Antioxidant. Grows locally. Always mind sales when on vacation on the island. Spot them as 'Ofertas' or 'Rebajas', as called in Spanish. Some fashion outlets discounted up to 75 per cent in Spring 2013, as Christmas shopping had been disappointing. Summer clothes sales normally start in July but, may also begin in June, already. With summer season for beaches almost all year round summer and beach clothes are sold cheaper frequently at any time of the year. Please mind the little boutiques in some of the lesser known commercial districts. You may discover fashion design outfits you had not expected and that you had not dreamed off. I had seen some in La Orotava in the old quarters. 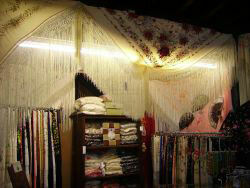 An interesting designer boutique is also right by Casa de Aduana Puerto de la Cruz Cruz. 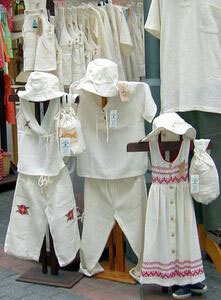 Cotton clothes made in South America may be found at little boutiques in North Tenerife. One of my favorite clothes store with large stocks is Zara Tenerife. Hear more about Zara Tenerife and why I prefer the one by the sea shore which must be the biggest for the Zara brand in Tenerife. Discover more about the Spanish fashion and the company from northern Spain which is so popular in Tenerife. Right opposite the Zara's of Santa Cruz is United Benetton. Mind its frequent sales for good quality children clothes. Tenerife traditional folkloric outfits are adorable for men or for women, except the lady hats in my mind. 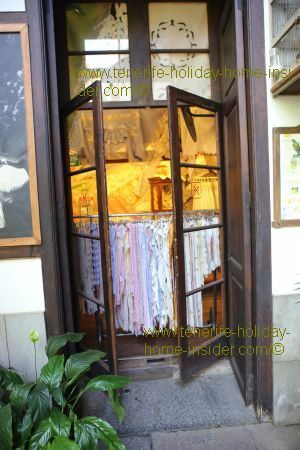 Casa de los Balcones offers a big treasure chest for buying beautiful traditional Tenerife gifts. Of course, hand made embroidered garments can't be cheap and some are of pure silk. 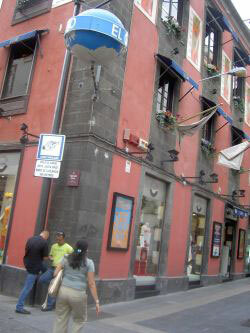 'Casa de artesania' over the road also has a large Folklore selection for shopping in Tenerife. See it at www.casa-balcones.com which has another retail outlet at La Villa Alcampo by the TF5 freeway, exit 36. You'll find lace and embroidery Tenerife is famous for in all resorts and towns including Garachico where shop El Limonero arts and crafts has a lovely selection of other gift articles, too. By the way, Garachico shopping used to be different with a strong concentration of history all around. 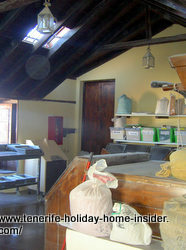 You can purchase this toasted cereal flour by the kg at the Gofio factory shop in la Orotava at about 200m up the road from Casa de los Balcones. Buy this typical staple diet of Tenerife with an acquired taste for the fun of it for as little as €1,20. Mind, Gofio which is cheaper than wheat and oats is not sold in all Spanish provinces. 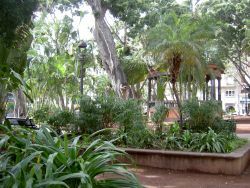 It will open up some interesting conversation points on the Guanches. Dulces de Almendras sweets of sugar or chocolate coated almonds. Cured goat, sheep and normal dairy cheese with a cured mixture of all three. Basket ware from Masca (cestas in Spanish), even made of palm leaves but hard to find now. 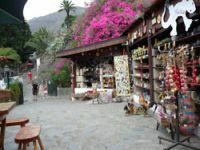 Casa de la Artesania and the tourist info shop in Puerto de la Cruz..
Shopping in Tenerife is supposed to be cheapest by tax. Igic the Canaary Island retail shopping tax went up from 5% to 7% in 2012 which is still cheaper than the IVA with 21% on mainland Spain. However, much is imported on Tenerife Island via its Free Port Santa Cruz Mercado Librefrom Asia and from South America. A brand like Marlboro will set you back by about €35,00 a carton when bought at an Indian outlet, at a store such as one at San Eugenio shopping Center in Avda Pueblos , 20 Playa las Americas, at the Souterrain shop by San Telmo in Puerto Cruz of at an Estanco. Cigarettes are cheapest in an Estanco but constantly subject to price changes. Look out for the brand Elyxir which used to be a Marlboro copy. Cheaper cigarettes set you back by €25 for a carton in June 2018. Luxury taxes are pretty low, indeed. Cigarettes, liquors and perfumes or cosmetics are proof of that. Even products made on mainland Spain cost less. 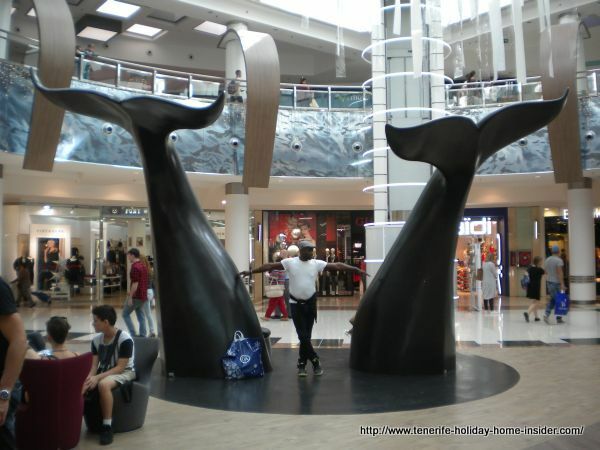 This makes shopping in Tenerife so interesting for expats and for for tourists on holiday. Acquiring a new car in Tenerife is, always, recommended as opposed to bringing one in. At A road running parallel to La Villa Alcampo La Orotava you can view many, many used cars that face the TF1 Free Way. Owners leave them there with asking price, mileage and phone number attached in order to sell. Other Tenerife shopping news concern the Corte Inglés with its so called 'Centro de Oportunidades' which was inaugurated in May 2012 at El Trompe beside La Villa Alcampo mall. Maternity clothes at C and A and more at Centro Comercial Meridiano of Santa Cruz Tenerife capital. It's almost between Tenerife Parque Maritimo and the big Titsa bus station by Avda.Tres de Mayo. The gigantic shopping mall CC Meridiano does free talent shows for children up to 12 years old, is proud to give you free Tenerife Internet and free parking too besides an enormous scope for shopping in Tenerife. Secrets on what to look out for in Shops for health, such as organic produce, best organic teas, best meatloaf and more..
Saroj Supermarket is a branch of the same Asian shop in Tenerife North. More about it under Puerto Cruz shopping in Tenerife just now. Puerto de la Cruz shopping in Tenerife has an exciting range of shops like El Aderno, La Ventita, stores, malls, Massimo Dussi, Bershka, Stradivarius, Desigual fashion and of course La Villa Alcampo Centro Comercial El Trompo and its funfair. Interesting links for shopping in Tenerife. Shopping in Tenerife for fish and seafood by season. Shopping Buenavista with sugar free chocolates and diabetic desserts to buy at El Aderno. Toscal Longuera Tenerife business for shopping. Tenerife shoe repairs where keys are sold sometimes one shop of which is in a rather peculiar insider place of La Orotava. Shopping in Tenerife South for traditional Indian Clothes and accessories at the City Center at Playa de las Americas is possible here. 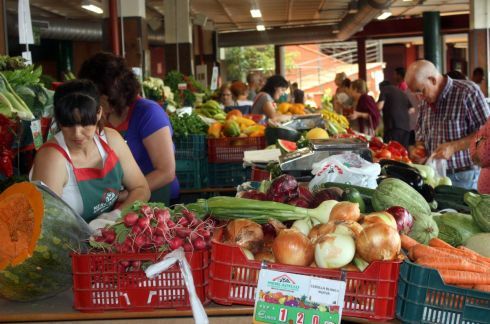 More on farmers' markets, Mercadillos and Rastros of Southern Tenerife and on buying on vacation at Costa Adeje. There, get tips for shop tax refunds besides shopping in Tenerife. Discover designer boutiques, hotel shops, San Eugenio's little market, Arona retail outlets, encounter Beach Fañabe shops as well as the Safary shopping centers. Interesting shopping tax info by the European Union Commission for people from outside the EU who buy in Europe which includes Tenerife as well as more must know important regulations. Anything you are still looking for? Want to Jump Back to Top of Page?